SpeechTechie- Technology, Apps and Lessons for SLPs and Teachers who like Words: Saturday Screencast: Google Lit Trips and "Make Way For Ducklings"
Saturday Screencast: Google Lit Trips and "Make Way For Ducklings"
This is the inaugural edition of the Saturday Screencast! I'd like to publish a screencast at least once a month, but probably more frequently. This one is based on a resource I presented at ASHA, and which a few eager attendees had questions about after the session. This is one of those resources that's sorta hard to explain without showing how it works, hence the screencast. Google Lit Trips is a resource of KMZ (Google Earth Format) files that correspond with works of children's literature. I recently used the Make Way For Ducklings activity and it was a great hit, even with 7th graders. 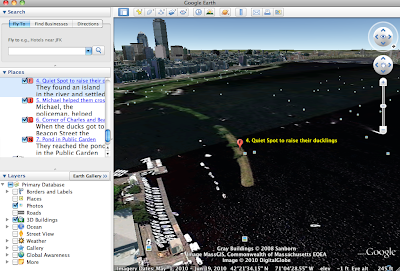 The advantage to viewing a story in Google Earth is that the imagery can be used to elicit a lot of descriptive language and discussion about the setting, a key narrative element. Check out how it works below and have fun with this "ducky" resource- one of Boston's faves. I am very open to suggestions on what would make good tech screencasts for SpeechTechie readers. What's something you'd like to know how to do? Thanks, Wesley. I agree with you about GE being very powerful. Resources like Lit Trips are wonderful because I think people understandably find it really difficult to wrap their heads around creating their own content in the Places Panel- It's just too hard! I hope in GE 7 they make this more user-friendly. Thanks for reading and for your comment.